Research & Innovation Strategies for Smart Specialisation (RIS3) are designed, implemented and monitored in the framework of a set of directives, regulations and communications at European Union (EU) level. The EU level acts are transposed or applied into national legal, regulatory and administrative laws, regulations and procedures. This creates a complex legal environment in which the management authorities responsible for ESIF as well as the public-private partnerships involved in RIS3 operate. The Regulation (EU) 1301/2013 of the European Parliament and of the Council of 17 December 2013 is the legal base which defines a ‘smart specialisation strategy’. ‘Smart specialisation strategy’ means the national or regional innovation strategies which set priorities to build competitive advantage by developing and matching research and innovation own strengths to business needs to address emerging opportunities and market developments in a coherent manner, while avoiding duplication and fragmentation of efforts. A smart specialisation strategy may take the form of, or be included in a national or regional research and innovation (R&I) strategic policy framework. Smart specialisation strategies shall be developed through involving national or regional managing authorities and stakeholders such as universities and other higher education institutions, industry and social partners in an entrepreneurial discovery process. Source: Guide to Research and Innovation Strategies for Smart Specialisations (RIS 3). European Commission (2012). ESIF instruments provide EU Member States with financial assistance to deliver the EU2020 strategy of Smart, Sustainable and inclusive growth, increasing economic activity and employment across the EU. The implementation of ESIF in Member States is set out in the& EU Common Provisions and underpinned by other European regulations. 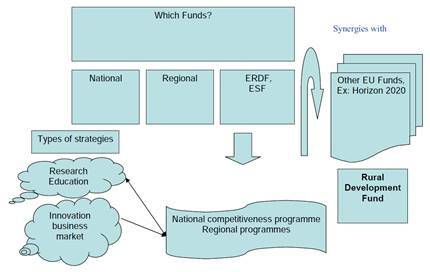 A national and/or regional RIS3 is an ex-ante conditionality for R&I investments under the European Regional Development Fund (ERDF) for the programming period 2014-2020. The ERDF focuses its investments on a limited number of ‘thematic objectives’ (TO) including Innovation and research (TO1); the digital agenda (TOX); support for small and medium-sized enterprises (TOX); and the low-carbon economy (TOX). ERDF resources allocated to these priorities depends on the category of region: in more developed regions, at least 80 % of funds must focus on at least two of these priorities; compared to at least 60% in transition regions; and 50 % in less developed regions. Furthermore, ERDF resources must be channelled specifically towards low-carbon economy projects as follows: more developed regions: 20%; transition regions: 15%; and less developed regions: 12%. Cohesion Fund (CF): funds priority Trans-European transport links and key environmental infrastructure projects. This has an indirect impact for RIS3 by improving location and providing opportunities for procurement of innovative solutions. Information on the legislative basis and secondary (implementing regulation) for other EU Funding instruments is available from the responsible directorate-generals. In addition to legislation governing the use of the various European funds and instruments, the EU’s State Aid regulations (http://ec.europa.eu/competition/state_aid/overview/state_aid_procedures_en.html) provide an overarching framework on how financial support can be provided to enterprises and other organisations in the Member States. Beyond the financial instruments, there are a set of regulations governing different legal options that impact on governance both at European and national levels. These include notably the legal forms that can be adopted by public-private partnerships, the possibility for public or academic bodies to take stakes in other private or not-for-profit entities, etc. At the current time, aside from eur-lex, the main information source on ESIF related regulation is the InfoRegio site of DG REGIO of the European Commission (http://ec.europa.eu/regional_policy/en/information/legislation/regulations/). DG REGIO has launched a wiki tool ‘regiowiki’ so that in addition to being able to download the full text of the legislation on InfoRegio, it is now possible to alternatively log on to a specific application, which enables users to navigate through the primary legislation, secondary legislation, and guidance notes in a dynamic way. This new facility is available for English text only. Various commercial sites also exist that track EU legislation often structuring the information by theme. An example is http://global.practicallaw.com/country/eu-law from ThomsonReuters. This method will provide users with access to up to up to date information on legislative and related texts governing the smart specialisation design, implementation and evaluation process. The tool will provide a means of identifying, tracking and mapping (links between various legal acts, etc.) the legislation or related policy texts that provide a framework for the implementation of projects using the ESIF funds. This includes ERDF regulations and EU processes of selecting and funding projects in the framework of national / regional Operational Programmes (OPs). Various standard tools could be used to help users access and analyse the most relevant up to date legal texts. The use of a wiki model (OnlineS3wiki) integrated with a RSS tool https://en.wikipedia.org/wiki/RSS could be one option. Other possible tools could be include the use of webscraping (https://en.wikipedia.org/wiki/Web_scraping) methods to compile information on both European and national primary and secondary (https://en.wikipedia.org/wiki/Primary_and_secondary_legislation legislative texts. 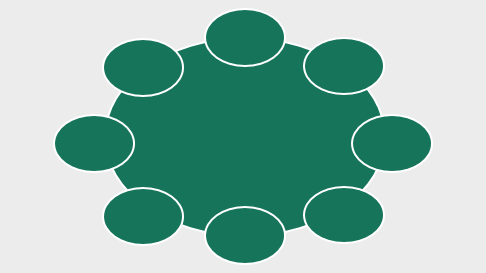 The possibility of developing visualisations that enable users to explore how one legislative act is linked to others (e.g. a primary legislative act and all related secondary legislation or synergies/linkages between primary legislative acts) should also be explored. The tool will enhance the understanding of RIS3 partnerships, and thereby improve governance, of the broad framework of EU legal acts, policy, decision making and where relevant case law (e.g. State Aid decisions). The impact is likely to arise from improving the timely adaptation of RIS3 to on-going legislative developments and by providing a simple, transparent, one-stop access for S3 stakeholders to all relevant legislation. State Aid legislation: http://ec.europa.eu/competition/state_aid/regional_aid/regional_aid.html (regional aid) and http://eur-lex.europa.eu/legal-content/EN/TXT/?uri=OJ:C:2014:198:TOC (R&D and innovation aid). 3. Examine the comparative advantages of developing a new tool or adding in material and legislative data/information to existing sites.